KEENE, NH – There’s no better way to start your holiday shopping than with Samson. 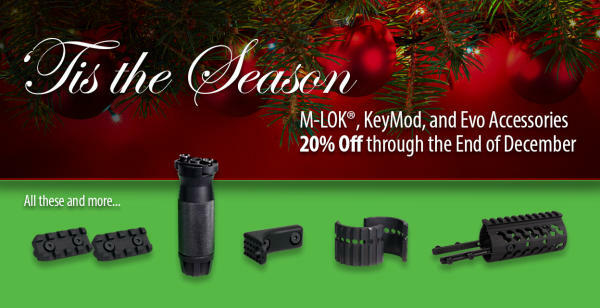 Now, through the end of December, Samson M-LOK, KeyMod, and Evo accessories are 20% off. If you are looking for that last-minute gift or stocking stuffer, or just want to treat yourself to a quality upgrade to your AR or AK, you’ll want to check out these accessories. For more information on all the products that are on sale, visit the Accessories page on the website (https://www.samson-mfg.com/handguard-accessories.html). Plus, watch for more incredible deals all December long on the Samson website. To see the entire line of Samson products, visit https://www.samson-mfg.com. For assistance in placing your order, please contact customer service at esales@samson-mfg.com or call 888-665-4370. Samson Manufacturing is a leading manufacturer of firearms parts and accessories. Using materials sourced in the USA, Samson products are designed, engineered, manufactured, and finished in Keene, New Hampshire. Since 1994, Samson has been delivering innovation, quality, and value to the commercial, military, law enforcement, and OEM markets. Follow us on Facebook, Instagram and Twitter.